Nihon Falcom’s profile has skyrocketed on this side of the Pacific in recent years, with the Ys series in full resurgence and the Trails in the Sky brand finally making The Legend of Heroes a household name. Meanwhile, Brandish is a name some may only be vaguely aware of today from its relatively low-profile Super NES remake 20 years ago, which was actually handled entirely by Koei, not Falcom. Now, though, Falcom is bringing Brandish back as an unlikely 2015 PSP game, subtitled The Dark Revenant, with the help of their great localization partners at Xseed Games. 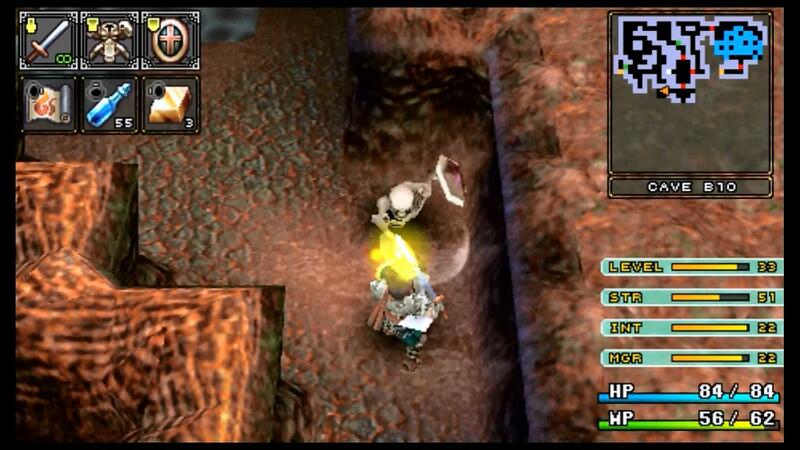 Many undead enemies, such as skeletons, will get up after being down awhile. Take care not to rest in close proximity to them. Brandish: The Dark Revenant is a third-person action dungeon-crawler which puts you in the role of Ares Toraernos, a swordsman being pursued by the sorceress Dela Delon for unnamed crimes against her master, to whom Ares was a chief rival. The chase eventually leads both Ares and Dela to be swallowed up by the ruins of a long-lost underground kingdom, where Ares must navigate his way back to the surface while both eluding the dangerous but clumsy Dela, and outbattling the ghost kingdom’s own inhabitants. I’d say she’s just a little upset. If you’ve been following Falcom’s recent work on Steam and on Sony handhelds, you’ll already have a good sense of their rare Midas touch as an RPG studio, and hopefully enough goodwill toward them to give Brandish at least enough attention to work as a starting point. That isn’t to say it’s for everyone, but don’t let its traditional roots fool you. 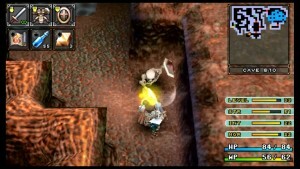 Favoring the third-person approach over the first-person view utilized by most games of this type allows for some intriguing level and battle design once you’ve adapted to the controls. This admittedly can take some doing when playing a game that looks like an old Legend of Zelda title and handles like Etrian Odyssey. However, both the game’s handling and the dungeon nuances, such as pit traps, wall arrows, and false walls should all come to you before too long. You’ll be navigating the fantastic level design featured in Brandish like a pro in no time. 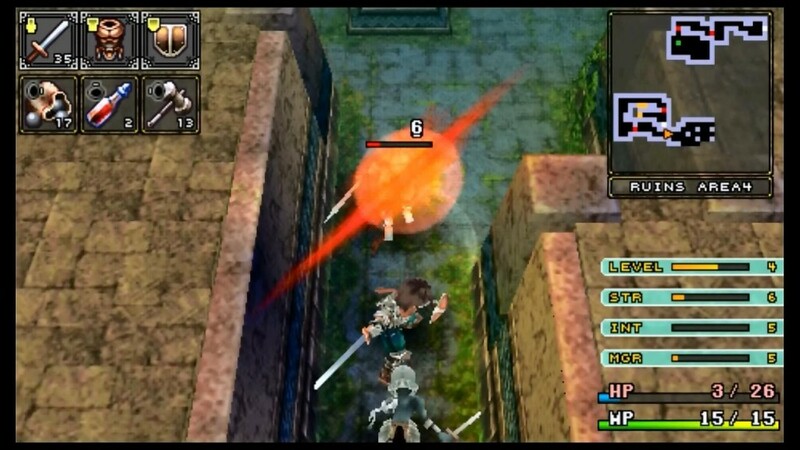 The balance between offense and defense is one you must master early on in Brandish. The combat plays out almost like an enlightened, streamlined take on Oblivion or Skyrim, but a Dark Souls comparison has also been made by Xseed themselves. You don’t get the customization of the Elder Scrolls series, as Ares is strictly a swordsman, and Dela, who you’ll unlock later, is strictly a magician. As Ares, standing directly next to an enemy will put up an auto-guard, during which all but the most overwhelming of melee attacks will be blocked outright. 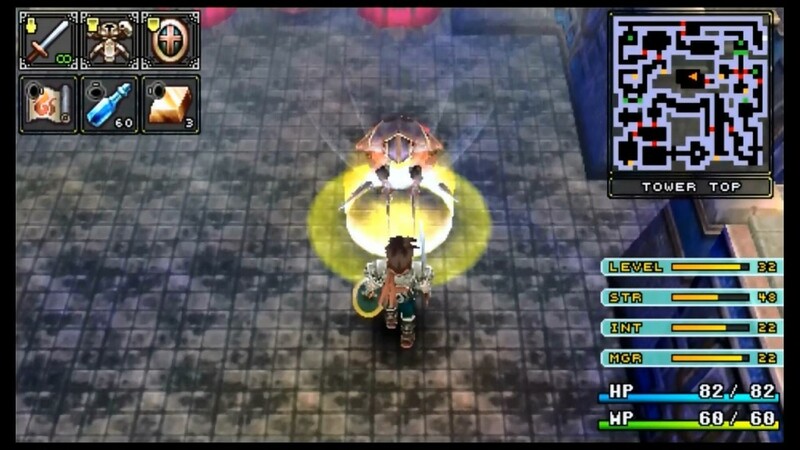 At this point, he can retaliate with a single strike, or with a two- or three-hit chain, however is appropriate before the enemy puts its guard back up. You don’t want to go crazy attacking, though, as you’re just as vulnerable while attacking or recovering as is the enemy. Moreover, your weapons generally have limited durability, and you don’t want to waste it on blocked attacks. 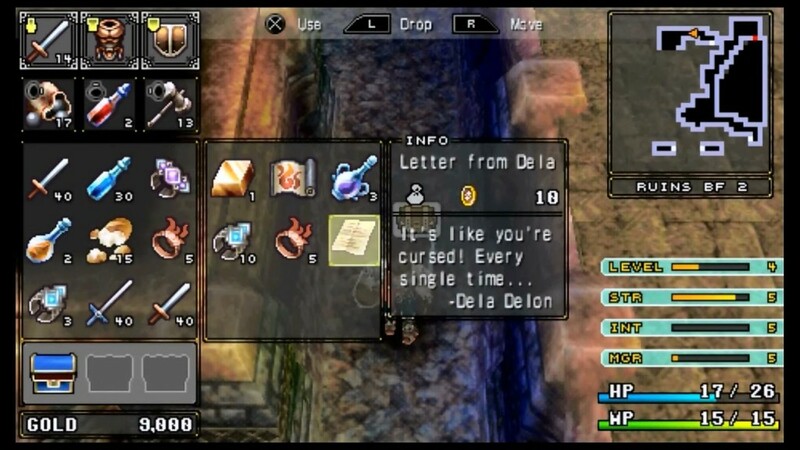 Things are a bit more difficult for Dela, who lacks Ares’ melee and defensive components, but by the time you’ve unlocked her quest, you should be armed with all the understanding you need to get through it. Where the combat really shines, though, is in the boss battles, which are admittedly all too few. Brandish takes the right cues from the right places in its boss encounters, and at its best, feels very reminiscent of even The Legend of Zelda: A Link to the Past in its boss design brilliance. They’re puzzle bosses, to be sure, but none so mind-crushingly elaborate that you’ll die more than a couple times before reaching that “a ha” moment where everything falls into place. Thankfully, they even included one to ensure that you had the game’s sense of movement down, before throwing decidedly more mobile foes your way. ProTip: Four Rakshasa Blades aimed at your skull is a bit much to block cleanly. Unfortunately, as a very traditional gameplay-first dungeon crawler, Brandish’s flavor is a bit too old-school to have the same kind of mass appeal as Falcom’s heavier hitters. Still, if you’re that certain kind of gamer who can get into the tried-and-true sense of exploration and masterful level design presented in Brandish, you’ll certainly find this to be one of the best games of its type. Just make sure you can appreciate it before dropping the $19.99 cost of admission.